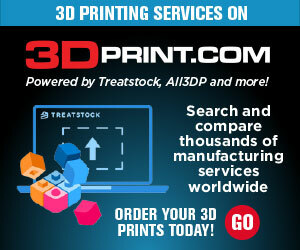 3D printing, investments, and filaments, oh my! In today’s 3D Printing News Briefs, Cytosurge’s FluidFM 3D printer wins an award at the IDTechEX Show!, while Print the Future is the first, and only, 3D printed furniture company to display at the largest furnishings industry trade show in the world. A concrete 3D printer prototype was developed in Colombia, and Russian specialists built a prototype of the country’s first large-scale metal 3D printer. In China, several government-owned companies will invest in emerging technologies, including 3D printing, and Coro Technology has introduced new premium filaments. Cytosurge, a spin-off company of ETH Zurich, introduced its novel FluidFM 3D metal printing technology in early 2016, and it has not gone unnoticed. At last week’s IDTechEx Show! in Berlin, Cytosurge won the ‘Best Development in 3D Printing Award Europe 2017’ for its FluidFM µ3D printer. The company’s Business Developer Edgar Hepp accepted the award. Omni-channel 3D printed furniture company Print the Future spent a week at High Point Market, the world’s largest furnishings industry trade show. Not only was it the first 3D printed furniture company to be featured at the market, it’s also the only one to ever do so. The show is held in High Point, North Carolina twice a year, and Print the Future, headquartered in Canada, occupied 960 square feet in the Mill Village area, which housed themes of craftsmanship, customization, design, innovation, and sustainability. Print the Future is completing a capital raise out of New York City, and plans to open its first retail store location there; the company opened its first temporary pop-up shop in NYC a few months ago. Leading Colombian construction company Constructora Conconcreto works to develop infrastructure and building projects, and in 2016 was recognized by Colciencias as a “Highly Innovative” company; Colciencias is the Colombian government’s leading policy development organization and works to make sure that the country has a scientific, technological, and innovative culture. The recognition allowed Constructora Conconcreto to access funds to invest in 16 innovation projects. The company recently introduced one of those projects: the large format Conconcreto 3D printer prototype. This is the company’s first 3D printer, and was developed in order to reduce time and costs, generate value, and transform the construction sector, as it will be able to 3D print prefabricated parts, facades, and houses. The concrete 3D printer was recently launched at the Conconcreto Innovation Center at the EIA University. Specialists in Russia developed a 3D printer prototype that can be used to 3D print large metal parts in outer space. This is the first printer of its kind in the country, and could eventually be used to 3D print metal items in places around the world that are difficult to access, and even at lunar stations. TETA, a research company based out of Tomsk, is just one of several working on the 3D printer; the developers say that the printer, which was developed in Tomsk, is able to produce large items “of an unlimited complex shape” that weigh up to 1 ton and have dimensions up to 3 cubic meters. Industrial firms around China have been encouraged by the state to create globally competitive conglomerates by adopting tougher efficiency standards and technical innovations. Last year, China’s state council approved a ¥200 billion venture capital fund to invest in new technologies; the fund would be financed by state-controlled entities. According to the official Xinhua news agency, several companies owned by the Chinese government have recently teamed up for this initiative, by setting up a ¥150 billion investment fund. The companies include the Postal Saving Bank of China, the Beijing municipal government, the Shanghai Pudong Development Bank, and the China Aerospace Science and Technology Corporation (CASC), which develops and launches satellites, space stations, rockets, and strategic missiles. The CASC announced the creation of the fund earlier this week, and Xinhua said it would be used to invest in some of the “emerging strategic industries,” like robotics, clean energy, aerospace, quantum communication, high-speed rail, and 3D printing. Last month during 3D Printing Days in Kielce, Polish 3D printing equipment manufacturer CORO Technology introduced its new line of premium ABS filaments. The Compositum Filament Series was developed and optimized specifically for professional FDM 3D printing. While more materials are being developed, there are currently only two ABS materials in the new line: Compositum ABS EX and Compositum ABS ST. The filaments are based on the use of granulates that were developed for the FDM 3D printing process, which makes material adjustments at the monomer level. ABS EX and ABS ST have very low linear compression, with excellent layer cohesion, so there are hardly any differences in the mechanical characteristics of the injected sample and the printed sample. The materials are already being used in rapid prototyping centers and production plants for various manufacturing projects, like bases for sand casting molds, spare machine parts, elements of hand prostheses, cassette parts, electronic production cases, and feeder adapters for the plastic industry. You can now purchase the Compositum Filaments Series in CORO’s online store. Discuss these stories in the News Briefs forum at 3DPB.com.